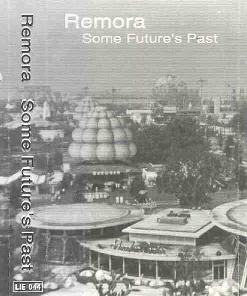 Remora - "Some Future's Past"
Remora is a solo project from North Carolina based musician Brian John Mitchell, who is also head of the excellent Silber Records label. I had reviewed Remora's Ambient Drones For Electric Guitar back in AI #8 and was impressed with Mitchell's ability to infuse a drifting melodic sense into a noise-drone realm. Some Future's Past is a little different, featuring mostly lo-fi songs with vocals. And while Remora's guitar explorations are still in evidence, these songs rarely exceed the 3 minute mark so there's little room for development. I enjoyed the Remora vocal tracks. One of the highlights is "Dimestore Ballad", which nicely piggybacks off the introductory "2". It's a slow paced lo-fi acoustic song with guitar that is simplistic but along with the vocals creates a reflective somber mood. "Destroyer" is another song that grabbed me with a sound that recalls John Lennon. There are also some enjoyable moments where the guitar takes center stage. On "Monster's Kiss" the droney vocals with nearly imperceptible lyrics seem almost secondary to the atmospheric strumming guitar. It's hard to explain but I liked the effect. Things get a little more aggressive on "Citizen Jane". It's a short song but the guitar creates swirling noise drones that provide an effective backdrop for the vocals. With "Rail" we start to take off into the deeper depths of space. A repetitive melodic chord pattern provides the foundation for gyrating cosmic sounds. At less than 3 minutes this sucker is just screaming for further development, but it's a nice piece all the same. Similarly in need of more time is "Skelodica". Bubbling space textures and throbbing notes have an electronic feel. But alas, just as it's taking on an identity it abruptly ends and brings the cassette to a close. In summary, I enjoyed Remora's songs but Mitchell's strengths are in his guitar work which requires far more than a mere 2-3 minutes to evolve. The Remora web site indicates a sizable catalog of releases. I'd be interested in hearing more examples of extended works. You can visit the Remora web site at: http://www.silbermedia.com/remora. Hear music samples at the Remora Mp3.com web site at: http://artists.mp3s.com/artists/113/remora_silber.html. For more information you can visit the Best Kept Secret web site at: http://www.indiepages.com/bestkeptsecret.